Beloved wife, mother and grandmother passed away Saturday, November 5, 2016 at St. Mary’s of Michigan Medical Center. Age 72 years. The daughter of George and Eleanor (Bukaweski) Slancik, Diane was born on October 4, 1944 in Saginaw, Michigan. She married Richard LaMountain on May 7, 1966. He predeceased her on November 28, 2014. Diane was a Registered Nurse for many years and then ended her professional career as a Human Resource Manager at St. Mary’s Medical Center. 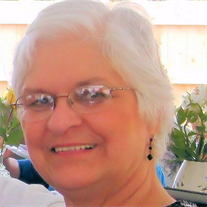 In her free time, she enjoyed camping, playing cards, watching and attending her grandchildren’s sporting events and was an avid reader. Surviving are four daughters, Jennifer LaMountain, Saginaw; Jill and Christopher Marhelko, Nuremberg, Pennsylvania; Jenelle and Kurt Phibbs, Saginaw; Julie LaMountain, Ferndale; seven grandchildren, Shane, Matthew and Eric Fletcher, Cooper, Landon, Jake and Lauren Phibbs. Diane was preceded in death by her brother, Timothy Slancik. Honoring Mrs. LaMountain’s wishes, cremation has taken place. Funeral Liturgy will take place at 11:00 a.m. on Thursday, November 10, 2016 at Holy Spirit Catholic Church, 1035 N. River Rd. Rev. Fr. Peter Gaspeny will officiate. Friends may call at The Snow Funeral Home, 3775 N. Center Rd., (between Shattuck and McCarty), where the family will be present on Wednesday from 2:00 p.m. until 8:00 p.m. and on Thursday at the church from 10:00 a.m. until the time of Mass. A Vigil Service will take place 7:00 p.m. Wednesday at the funeral home. In lieu of flowers, those planning an expression of sympathy may wish to consider memorials to Holy Spirit Catholic Church.